Kokubunsan Kokubunji Temple in Kokubun, Ichikawa city, Chiba prefecture now belongs to Shingon sect Buzanha. According a legend, Kokubunji Temple was founded by Gyoki Bosatsu, a great priest in Buddhism in Nara period, and it was called 'Konkomyoji Temple' until mid-Meiji era. So Kokubunji Temple is the remains of Shimousa Kokubunji Temple designated as the historical site by the National Government. The Kokubunsan Kokubunji Temple is succeeded the history since it was founded and worshipped by supporters and regional people, so the temple has reconstructed several times by them even though it has got fired, then it stands at Kokubun now. In spring, many cherry blossoms bloom beautifully and leaves on the large gingko tree are sparklingly changed color in fall. 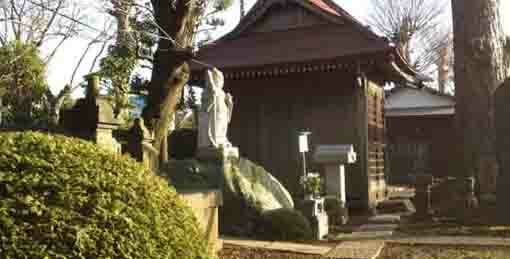 Besides it is one of the Seven Deities of Good Fortune (shichifukujin) in Ichikawa city. 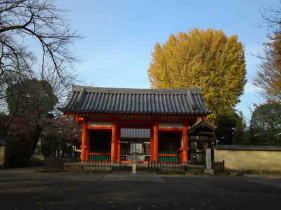 Why don't you visit Kokubunji Temple in Ichikawa city? 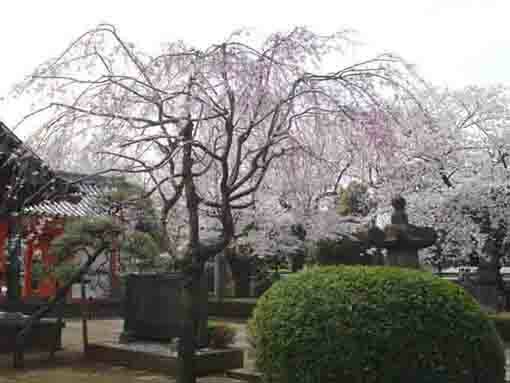 Shimousa Kokubunji Temple was founded in 741 by the Imperial Command by the Emperor Shomu, he commanded to build a temple named Konkomyo Gokoku no Terain a province throughout Japan to keep people's lives peacefully, Shimousa Kokubunji Temple was the remains of one of those temples. The old temple was built on the almost same area of Kokubunji Temple now, and the arrangement of buildings in the temple at the first time was called the Horyuji Style, the kondo hall, the pagoda and kodo hall were built as similar to Horyuji Temple in Nara. 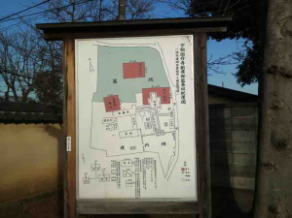 Because the provincial government was in Konodai, Ichikawa city, Kokubun in Ichikawa city was chose where the temple by the Imperial Command could build on. 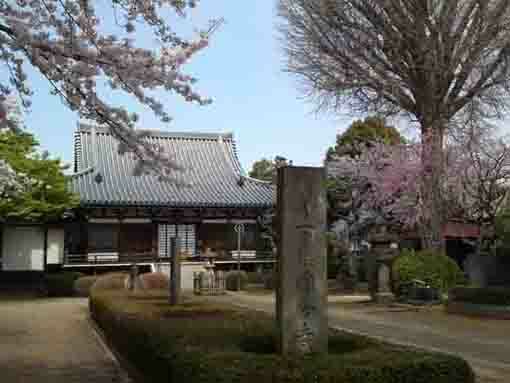 The estimated position of Shimousa Kokubunji Temple is about 850m east from the estimated position of the government, and Kokubunniji Temple, a convent, was built in the Kokubunniji Ato Park 350m northwest from the temple. The lands of temples were chose to be conforming to the Imperial Command to stand for long. According to Ichikawa no Mukashibanashi (the legends in Ichikawa city), Gyoki Bosatsu decided the areas to build them as they were adequate lands for the command, and he carved a statue of Yakushi and dedicated it in the Temple. There were no records of the date of the construction, but it could be built in Nara period. Kokubunji Temple now does not preserve any buildings recalling the flavor of Nara period since it has got fired several times. 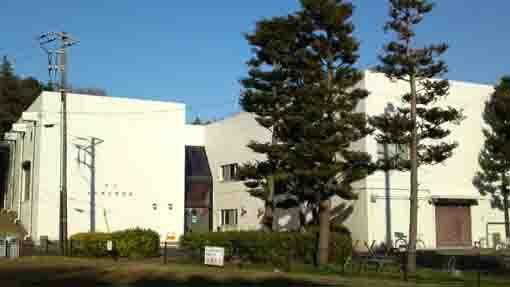 The archaeological researches from 1965 to 1966 revealed the site of the main hall, pagoda and lecture hall in the Horyuji Style arrangement of buildings. Under the present main hall, there are foundation stones of the Kondo hall measuring 31.5m from east to west and 19m from north to south excavated. And 40m from the center of the foundation stones to northwest, the foundation stones of Kodo hall measuring 26m from east to west and 18m from north to south found under the tombs. And also 39m from the center of the foundation stones of the Kondo to west, there are the foundation stones of pagoda 18m square. And the excavation research from 1989 to 1993 found the range of the temple measuring 300m from east to west and 350m from north to south and revealed the town planning and the site for labors to work at the temple. A remain of Noborigama Kiln that burnt tiles to build the roof of Kokubunji Temple was discovered near the temple. And the tiles were decorated with Hosoge pattern one of the popular styles from China at Nara period. Original buildings in Kokubunji Temples have not existed since they were destroyed and burnt down by several battles and disasters since the Warring States Period. According to Edo Meisho Zue, Katsushikashi and Katsushikashiryaku, the tower gate built in Nara period, the Yakushido dedicating the statue of Yakushi Nyora curved by Gyoki, the Shakado preserving the statue of Shaka Nyorai, Taishakuten and Bonteno in it, the Kodo and the Main Hall stood in the site, and it remained a flavor of the original landscapes until it got fired in 1891. Though it has got several disasters, Kokubunsan Kokubunji Temple remains 1300 years of its long history by its faithful supporters and people living around. 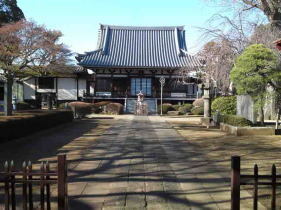 The present main hall and the Nandaimon gate were built in Showa era. Bishamonten is one of the Seven Deities of Good Fortune in Japan, so he is a very popular god. Bishamonten is a guardian deity called 'Vaisravana' in Sanskrit, and Kubera in Hinduism. Bishamonten is only a god in Shichifukujin who looks like a samurai Busho. His body is yellow, shows anger, wears armors, puts a treasure club in his right hand, puts a pagoda in his left hand and treads on a devil in general. He is one of the Four Devas so the god has another name 'Tamonten' in Buddhism. He becomes the god of treasure and fortune, and lives in the north of Mt.Sumeru (Shumisen) and belongs to Taishakuten to protect the north with Yasha and Rasetsu. Sometimes, he is called Seziten as Bishamonten brings treasures to people. Moreover, Bishamonten is one of the Twelve Devas in esoteric Buddhism. Bishamonten is worshipped as a god of treasure. The statue of Tamonten in the Kondo Hall in Horyuji Temple in Nara is the oldest one, and one in the main hall in Kuramadera Temple in Kyoto and Sekkeiji Temple in Kochi prefecture are famous. 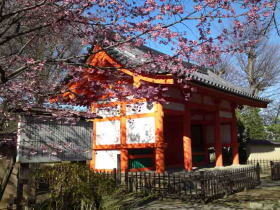 Kokubunji Temples, the provincial temples, and Kokubunniji Temples were established by the Imperial Court in Nara Period. In 741, the Emperor Shomu issued an Imperial edict of building Kokubunji Temples to control the nation peacefully by Buddhism. The Emperor Shomu planned to build the temples for keeping the nation tranquil and a huge harvest every year by Buddhist prayers and ceremonies. Todaiji Temple in Nara was the head temple of the Kokubunji Temples in every provinces, and Hokkeji Temple in Nara was the head temple of the Kokubunniji Temples. 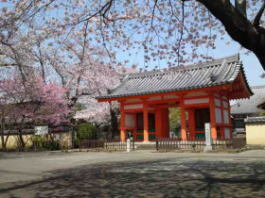 Kokubunji Temples were legally named Konkomyo Shitenno no Tera and Kokubunniji Temples were named Hokke Metsuzai no Tera. Kokubunji Temples could be built near the privincial capitals and as close as to be able to hear the sound of bells ringing from Kokubunniji Temples. They dedicated the statues of Shakanyorai (Shakyamuni Tathabata), the seven-stories pagodas could be built in the sites of the Kokubunji Temples to preserve Konkomyosaishookyo (the Mahayana Sutras) in them, the Kokubunniji Temples could keep the Lotus Sutra and Saishookyo written by the Emperor Shomu with gold ink were kept both Kokubunji and Kokubunniji Temples. They all were established in the Imperial Edict, and also they were ruled that 20 priests always works at a Kokubunji temple and 10 priestesses at a Kokubunniji Temple. Kokubunji Temples and Kokubunniji Temples were supported by the Imperial Court and they took on the responsibility to manage priests and priestesses in each provinces. Late Heian Period, most of Kokubunji and Kokubunniji Temples were eliminated as the Imperial Court had lost the power and could not support them. Most Kokubunji Temples now existing belong to different sects of Buddhism from that of them and seldom remain the original flavor of them in Nara period. And the most eliminated Kokubunji and Kokubunniji Temples are preserved as remains in some historical sites or parks after they were archaeologically excavated and researched. 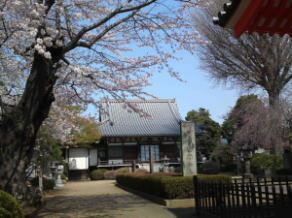 Now, Tobunji and Tobonniji Temples were built in Iki and Tsushima Island. Gyoki was a priest belonging to Hosso Sect in Nara Period, he was born in 668 ni Kawachi province (Osaka) and passed away in 749 in Nara. His family name was Koshi. When he was fifteen years old, he became a priest and learned the studies in Hosso sects from Gien at Yakushiji Temple in Nara, so he outsandingly understood several difficult sutras very fast. And he completed the meditative concentration in woods. After death of his mother, he traveled throughout Japan to train himself and help others' to train themselves, thousands of people followed him. Gyoki took his followers to built free inns, roads, banks, bridges, temples and some social contributions with people such as Gotomari port at Setonaikai Sea and 49 temples in Kinai are famous. However, the Imperial Court forbid his early activities by the Imperial Edict since he violated the law of priests and preiestesses that he had misled people. But he had not got any definite punishments. Gyoki changed his incantation soft, and he started preaching in the temples instead of preaching at roads, so he responded flexibly to the oppressions by the Court. Even though the Imperial Court oppresssed several times, Gyoki and his followers grew larger and larger, the court could not ignore their activities. In 731, the Court gave them permission that over 61 years old man and over 55 years old woman who follwed Gyoki could be priests and priestesses. In 743, Gyoki was given the title of Daisojo (the head priest), so he was the first head priest in Japan and he took the highest rank in religious society in Japan. Moreover the Emperor Shomu became a devout in him. He helped the Emperor to build Todaiji Temple in Nara and Kokubunji Temples throughout Japan and he traveled around to collect many donations to build the Great Buddha Hall in Todaiji Temple. After he gave Bosatsukai to the Emperor Shomu and his family, Gyoki died at 80 (some said 81 or 82) at Sugawaradera Temple 3 years before the completion of th Great Buddha in Nara in 749. He was counted as one of the four holy priests of Todaiji Temple. The Imperial Court gave aposthumous title 'Gyoki Daitoku' in 738. And also people at that time called him 'Gyoki Bosatsu' with their faith. There are some miracle stories of Gyoki, they are on Daisojosharibinki, Shoku Nihongi, Nihon Reiiki and Gyoki Nenpu. 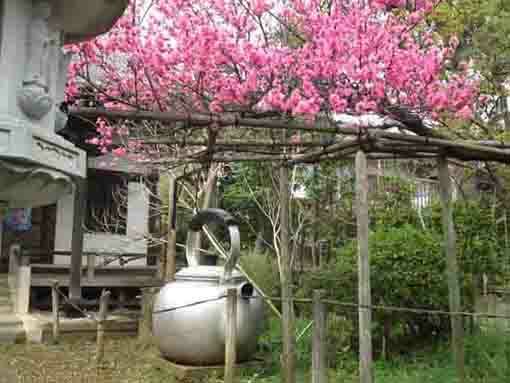 The pottery named Gyokiyaki, the tiled roof named Gyokibuki are famous. And it is also famous that Gyoki was the first man of drwaning the coplete map of Japan called Gyokizu. Kokubunsan Kokubunji Temple has great accessibilities from both Narita and Haneda International Airport. 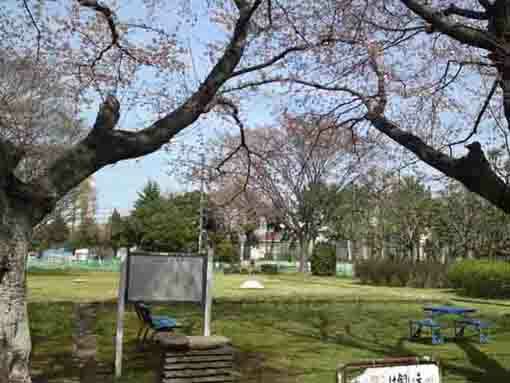 Take 25 minute walk from Ichikawamama Sta.